Standing on the South Bank of the Ottawa River in the eastern part of southern Ontario, Ottawa is the capital city of Canada. Lookupfare aims to offer the best cheap flights to Ottawa. Choose from numerous Ottawa Flight Deals at some of the most incredible prices. Also, find some of the most enticing deals on last minute flights to Ottawa. 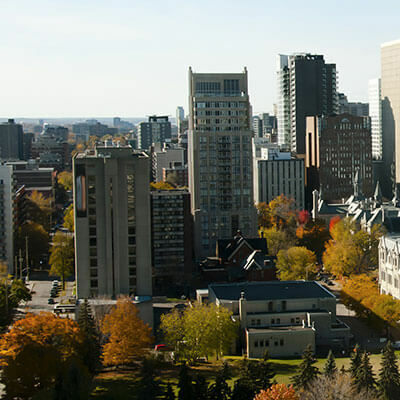 Ottawa is the most educated city in Canada and is home to a number of post-secondary, cultural and research institutions. It also has the highest standard of living in the country and low unemployment. The city over the past few decades has also managed to evolve into a technological and political center of the nation. Canadian War Museum - Renowned internationally for its symbolic architecture, this military museum displays Canada’s rich military history through personal stories, interactive presentations, artwork, and photographs. Parliament Hill and Buildings - Located on a 170-foot tall bluff overlooking the Ottawa River, this historic site houses the offices of the members of Parliament, the Senate and the House of Commons. Rideau Canal – This nature park is one of the oldest landmarks in Ottawa. Jam-packed with boats in summer, it becomes the world’s longest skating rink in the winter. Grab some cheap airline tickets to Ottawa and treat yourself with some of the most beautiful views the site offers. National Gallery of Canada – Founded in the year 1880, this specialty museum boasts of a trust of a collection of Canadian and European sculptures, paintings, prints, photos, and drawings. Notre Dame Basilica - Recognized by its twin spires, this beautiful and ornate gothic-style cathedral is a must visit site for the sacred and religious folks. Lookupfare has devised all deals and offers with the sole aim of providing you the best low-cost flights to Ottawa. Go through our numerous deals and offers and book the best cheap plane tickets to Ottawa. Also, with Lookupfare not only you will find cheap flight tickets but we also make sure you fly with the top most airlines and the get to enjoy the best of the in-flight amenities.